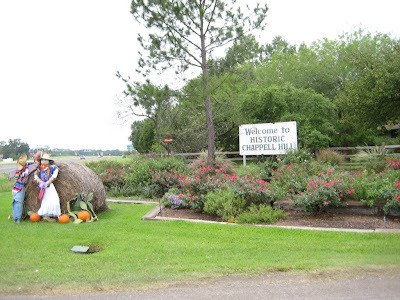 With Texas's first cold front of the season, we were feeling frisky to check out the Scarecrow Festival in Chapell Hill. We made so many memories today and are beginning to realize how grown up our babies are becoming. We loaded them up in one wagon (yes, all four in one wagon) and navigated the crowds. Halfway through, we ditched the wagon next to a fence and were walking and holding hands with the kids wandering the festival grounds on foot. Not once did they try to bail on us, run or touch any of the tempting merchandise at just an arm's length from them. 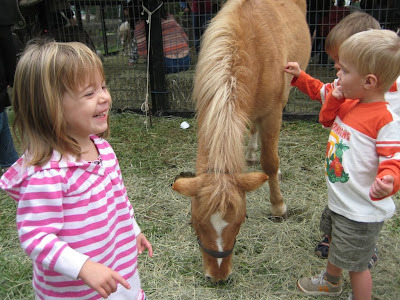 We hunted down the petting zoo which we were bummed to find was $3 per child to enter. With only $10 in cash on us, we ignored the dirty looks and let them pet all of the animals on the outside of the fence for free. This included the sassy pony who must've been kicked out for bad behavior. We let the kids pet her during which she whinnied so loud it about knocked Sophia over! That marked the end of the free exhibit for our little family. 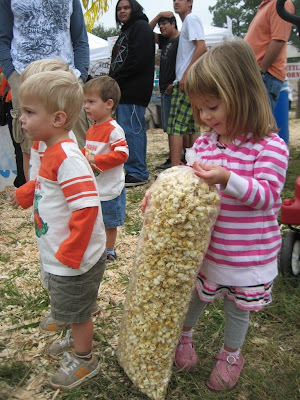 After meandering through the fairgrounds with such a well behaved bunch we thought it was appropriate to reward them (and ourselves) with sugar. We had $10 burning a hole in our pocket. 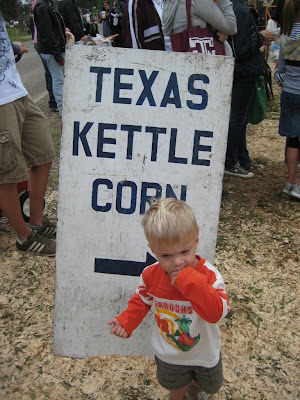 So we stood in a line one dozen deep for a Texas sized bag of some killer kettle corn - $7. Right next door they were dishing up some massive cotton candy cones - $3 - perfect! It was worth every penny as the crowd was entertained by the squealing delight of our four two year olds trying cotton candy for the first time. Finn, who is a little guy that likes to put everything in his mouth just to see what it tastes like, feels or does once it's in there was going crazy for it! It was too sweet for words - check it out yourself! Too Sweet! from Mari Goerlich on Vimeo. That is priceless-they look as if they have found the "land of milk and honey". Adore the cotton candy faces. Love to all of you! I watch you guys and realize how I let my "clean-freakyness" get in the way of some funny memories. I vetoed the cotton candy idea once because I was picturing it all over them...that was the funniest part of that video. that just made my day!! Too cute. What an awesome thing! I actually saw you guys yesterday by the petting zoo! I was very busy chasing my 4 kiddos so I didn't get to say hi. Love your blog! It was perfect weather and a great time! PRECIOUS!!!!!!! You have the cutest kiddos ever!!!! Love the Cotton Candy Faces!! Love it! Oh that looks fun! I need to start paying attention to the event schedule around here. Adorable cotton candy shots.